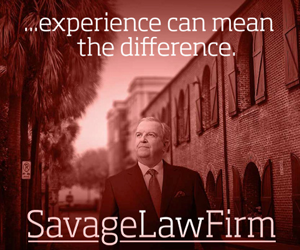 Post Tagged with: "city council"
One thing that has become consistent in the City of Myrtle Beach over recent years is the law will be applied inconsistently. It’s not what you do, it’s who you are that matters. The Fifth and Fourteenth Amendments to the Constitution guarantee due process and equal application of the law to both federal and state jurisdictions. But not in Myrtle Beach! The city is currently being sued by business owners in the city for violating the owners’ rights guaranteed by the Constitution and those amendments with what the city calls its Entertainment Overlay District. Inside that district, businesses are prohibited from selling legal products such as CBD oils and Vape accessories with the threat of having their business licenses revoked and the business being closed down. Those same products are sold in other areas of the city without any restriction or harassment by city officials. Most, if not all, of these businesses are beachwear stores owned by Jewish businessmen, which brings in other issues to the lawsuit in the form of violations of the Civil Rights Act and discrimination. City officials have said these restrictions were put in place by city ordinance in an effort to make the district “family friendly” – the city’s favorite buzzword. However, there have recently been three raids on two hotels within the same district for the sale of illegal drugs on the properties, you know heroin, cocaine and those types of drugs, with no threat to business licenses. 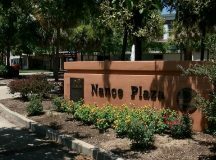 There is no indication that the owners or operators of those hotels were involved in the illegal activity, but that hasn’t stopped the city from closing down businesses as “nuisances” for similar activity in the past – Natalia’s Bar and Grill in the Superblock area comes quickly to mind. Natalia’s was closed down by the city in December 2016 as a nuisance for activities such as drug sales that occurred outside the building but in the near vicinity. One month later, the city owned the property. 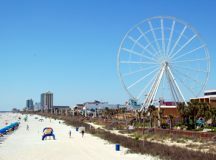 News of Ocean Boulevard merchants suing the City of Myrtle Beach to overturn the entertainment overlay district ordinance the city passed in August 2018 was generally lost in the hype created by the county administrator’s bogus allegations last week. 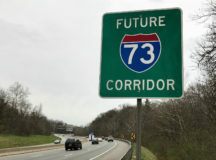 However, the lawsuit could prove to be more far reaching in reining in the ability of local governments and their officials to run wild over the rights of businesses and citizens whenever and wherever they choose. The lawsuit was filed in Florence Federal District Court because the ordinance in seen by the business owners as an all-out attack on their constitutional rights. The lawsuit alleges curtailing of free speech guaranteed by the 1st Amendment to the Constitution; lack of due process and equal protection of the law guaranteed by the 5th and 14th Amendments and civil rights violations in that the ordinance targets businesses that are almost exclusively owned by Jewish merchants. 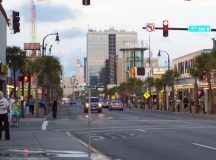 On Tuesday, Aug. 14, Myrtle Beach City Council voted 5-2 to approve new zoning regulations commonly referred to as an “overlay” for Myrtle Beach’s downtown Ocean Boulevard district. The overlay proscribes various categories of merchandise, which after Dec. 31 of this year can no longer be sold in the areas affected by the Overlay. In so doing, at the stroke of a pen, city council rendered various businesses, perhaps dozens of businesses in the Ocean Boulevard district, either financially devastated, or (as of little more than four months from now) illegal altogether. It’s worth noting that the same city council, at the very same meeting, also celebrated the Constitution. 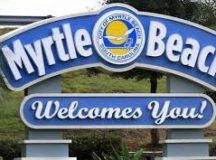 Your city council has designated Sept. 17-23 as “Constitution Week” in the City of Myrtle Beach, apparently without any ironic intent. In the interest of full disclosure, I represent some of the downtown merchants whose lives have been up-ended by the passage of the overlay ordinance. I spoke on their behalf at council. But my feelings about council’s actions in this matter would be the same, whether I represented these merchants or not. The facts are rather startling: most of the downtown merchants only heard about the looming overlay a mere three days before council’s vote – and not from the city, but from various news reports published over the weekend. There was no debate. No give and take. Just a couple of days to get ready for a vote. At the Aug. 14 council meeting, there was a brief comment period where public comments were limited to a mere three minutes. And that process seemed more of a formality, really, one that belied the underlying reality that council had already made up its mind, and wasn’t really interested in what the public had to say. Some city council members were seen to be checking their phones during the public comments. And make no mistake, government may move at its own pace in other quarters, but during public comment, three minutes means three minutes. Not three minutes and three seconds, but three minutes. Speakers were cut off mid-sentence, mid-thought, even mid-word. “Sorry” the Mayor would politely say, “your time is up”. The possibility of a Tourism Development Fee in North Myrtle Beach suffered a crushing defeat Tuesday at the polls. The unofficial tally was 188 Yes votes for the TDF against 3,050 No votes. The results will be certified by the North Myrtle Beach Election Commission Thursday. Defeat of the TDF is not surprising. What is surprising is the turnout. In the days before the election, I spoke with several seasoned political professionals from Horry County to get their predictions for turnout. They all agreed the number of voters that would go to the polls would range from 750-1,000. Those predictions were based on past turnout for special elections in Horry County and tempered by the fact that candidates were not on the ballot, just a single referendum question. To put the numbers more in perspective, a special election in March on a referendum question only drew a total of 3,238 votes. The vote for mayor in the November 2017 city general election saw 3,670 total votes with Mayor Marilyn Hatley winning with 2,765 votes out of 3,670 votes cast. In that same election, councilman Terry White ran unopposed and only gained 2,894 votes. To call the number of votes cast on this referendum question astounding is to understate it. But, it may also prove to be the high-water mark of politics for the current city council. The result is exactly what, I believe, North Myrtle Beach city council members wanted from the beginning, a resounding repudiation of the TDF in a referendum vote to take that issue out of the political discussion once and for all. Several council members were quite outspoken with op-eds and social media during the campaign about their opposition to the TDF. In my opinion, a presentation about the TDF by Mike Mahaney at the Tidewater Homeowners Association on February 19, 2018, one that I personally attended, hinted at other, one could say even better, options for the city than the TDF. The entire North Myrtle Beach city council attended the meeting after the city issued a notice three days before that there was no city council meeting February 19th. Voters in North Myrtle Beach have a choice on Tuesday when they go to the polls to vote on whether or not to approve a Tourism Development Fee in the city. Interestingly, the choice is not between voting the TDF up or down, although that will be decided. The real choice is how voters want to pay for infrastructure and other improvement needs in the city and who should be doing the paying. From recent discussions at the North Myrtle Beach City Council budget retreat, it appears some type of revenue increase is in the offing for North Myrtle Beach residents. 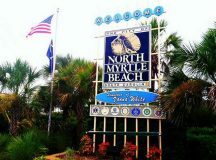 According to information I have received, the North Myrtle Beach City Council discussed a property tax increase of 2-3 mills during their budget retreat earlier in the week. A property tax increase would be paid only by the property owners in the city. 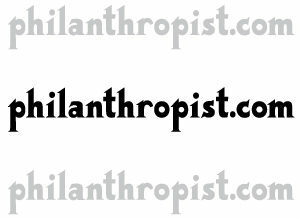 The TDF would be paid by everybody, tourists included, who makes purchases in the city. 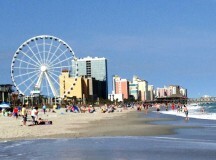 The TDF has the added advantage of providing revenue for targeted marketing of the North Myrtle Beach brand (cleaner, safer, family oriented) to tourists who are the lifeblood of the economy in the city. I attended a meeting of the Tidewater HOA recently where the North Myrtle Beach City Manager made a presentation on the TDF. Part of the presentation showed pictures demonstrating the need for more parking facilities in the city, an infrastructure improvement that increased revenue to the city will fund, according to statements by council. In addition, road improvements and continued staffing of public safety personnel were discussed as needs. Another part of the presentation compared revenue increases available from the TDF versus the possibilities from something called the Municipal Tax Reform Act, which is only at best a vague hope to at worst a pipe dream in the minds of city council. The above quote from the classic Charles Dickens novel “A Tale of Two Cities” accurately sums up the respective approaches being taken by the cities of North Myrtle Beach and Myrtle Beach on the issue of the tourism development fee (TDF). The North Myrtle Beach city council has scheduled a referendum vote for March 6, 2018, to allow voters in the city to determine whether a TDF should be allowed on purchases in the city. The Myrtle Beach city council approved the TDF nearly nine years ago by supermajority vote of the council. The council, even with three new members, appears ready to vote to extend the TDF beyond its initial 10 year approval period again by supermajority vote of council members. Council seems unwilling to allow the question to be put before its voters. Having voted for a referendum, North Myrtle Beach officials, both elected and appointed, cannot be seen as advocating for passage or defeat of the referendum in their official capacity. According to statements made to various media outlets, they are strictly adhering to this line to avoid any potential ethics problems. North Myrtle Beach city officials can and should tell the public how the revenue the city will receive from the TDF will be spent, i.e. public safety, parking, other infrastructure. It appears that all residents will get some benefit from TDF revenue. In Myrtle Beach, only 17% of properties in the city (owner-occupied properties) receive all the benefits from the city revenue. One has to wonder whether Myrtle Beach city officials would conduct themselves in the same ethical manner if a referendum on the question were pending in that city. Incumbents have been strong proponents of the TDF and even several of the new members, who said they thought a referendum should be held on the question of extending the TDF, seem to have backed away from those campaign pronouncements. I know of several instances where local media outlets have been contacted with a request to “take it easy” on Myrtle Beach city council members if they vote to extend the TDF. A sometimes heated public input session at last week’s DRC (Myrtle Beach Downtown Redevelopment Corporation) board meeting highlighted the agency’s confusion about its status and the responsibility it has to the public. The DRC likes to tout itself as a private corporation and some of its recent moves, such as secretly purchasing properties in the Superblock until outed by local media, speak to that attitude. However, South Carolina law is clear that the DRC is a public body and, as such, owes the citizens full transparency of its actions. The DRC was created by Myrtle Beach city ordinance and is funded from the parking fees collected from meters and lots on city property. The city set up a $10 million line of credit from a local bank for the DRC to purchase properties. Money to pay back draws on this line of credit comes from the parking fee revenues. Among those entities defined as a public body subject to the S.C. Freedom of Information statute are “any organization, corporation, or agency supported in whole or in part by public funds or expending public funds․” S.C.Code Ann. § 30–4–20(a). The parking fees, themselves, are a problem. 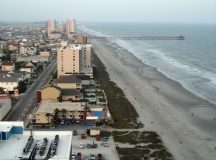 They appear to violate deed restrictions included when Myrtle Beach Farms transferred company owned land to the city along the oceanfront. This violation not only applies to parking areas charging fees along the Golden Mile, but also to the many areas in the south end of the city where parking fees have been charged for a number of years.